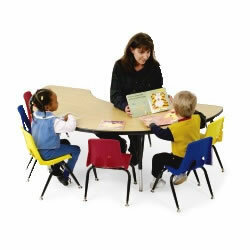 Kaplan provides high-quality wooden tables designed with preschoolers and early education teachers in mind. 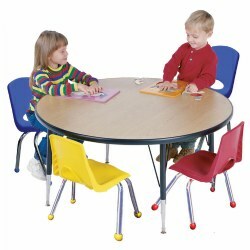 Our colorful plastic and foldable tables with adjustable legs encourage creativity in the classroom and are easy to accommodate to children of all ages. 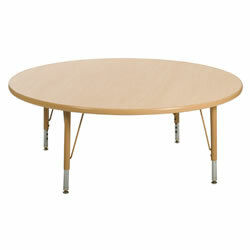 Tables come in square, rectangular, circular, and semi-circular shapes. 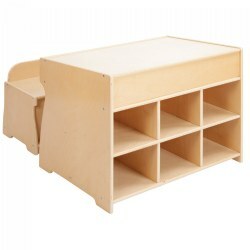 Also included are storage units, stackable chairs, and writing centers. 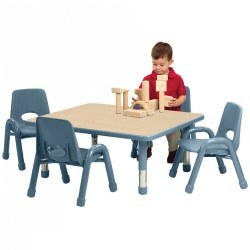 Whether you're looking for a block table for children or a shorter table for toddlers to use as they play, we have the selection to serve every classroom. 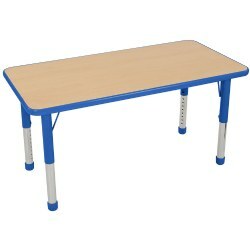 Color edge bands make these activity tables bright and cheerful! Includes 1 1/4" thick top with easy-to-clean high pressure laminate, soft rounded edges for safety, and reinforced leg brackets for sturdy, long-lasting durability. Color-coordinated legs are made of powder coated tubing with glide tips, and they easily adjust in 1" increments. Seats 4. Choose leg height and color. 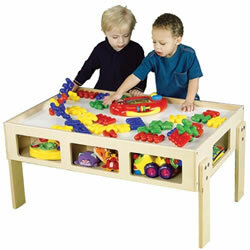 Children will enjoy collaborating together or working independently on chosen activities at this perfectly sized desk. Young learners can engage in a variety of tasks, such as writing, art, computer time, and games, while comfortably seated at a space designed with them in mind. Measures 22"H x 40"W x 18"D. Chairs sold separately. Quality materials and durable construction is the basis for this table with 1 1/2" thick high-pressure laminate tabletop surfaces and rounded bumper edges for safety. Chrome-finished legs adjust in 1" increments and have cushioned glides for easy movement. (14" to 23" high). Can seat up to 6 students. This writing center accommodates up to 4 children and can also be used as a computer station. 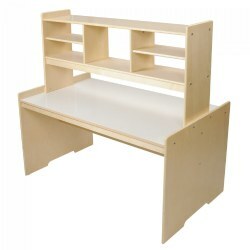 Constructed with durable Birch hardwood. 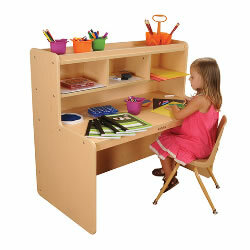 A convenient easy-to-reach center shelf handily stores common writing center needs while a top shelf stores supplies. (Chairs sold separately). Assembly required. 47"H x 47 1/2"L x 29 1/2"D. 90 lbs. 4 years & up. 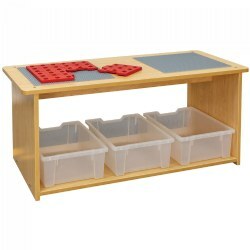 Large storage for pencils and crayons under the desk. A pencil well keeps writing tools from rolling off the desk top. Additional storage area is located behind the desk. Fully assembled. Desk: 23"H x 30"W x 21"D, bench: 12"H x 27"W x 12 1/2"D. Baskets and contents are not included. Color edge bands make this activity table bright and cheerful! 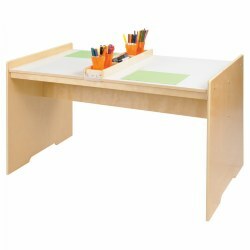 Includes 1 1/4" thick top with easy-to-clean high pressure laminate, soft rounded edges for safety, and reinforced leg brackets for sturdy, long-lasting durability. Color-coordinated legs adjust in 1" increments, powder coated tubing with glide tips. Ready to assemble-tools included. Available in two adjustable leg heights. 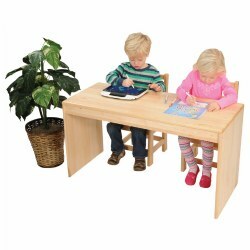 FunTable® Block Table 32" x 32"
Preschool table is suitable for 2 years & up and Standard table is suitable for 5 years & up. 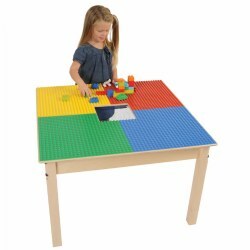 Compatible with most major brands of brick blocks, these tables feature bright, primary colored building plates with a center drawstring net bag for brick storage. The net bag is top-shelf dishwasher safe and can be used to sanitize the bricks. 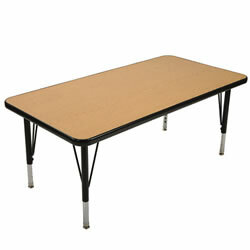 Made of hardwood, these durable tables are easy-to-assemble and measure 21"H x 32"W x 32"D each. Made in the USA. 2 years & up. 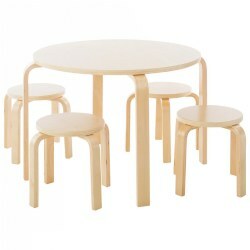 Accent your space with this Nordic designed table and stool set. Features a smooth, natural finish that will blend well with your environment. 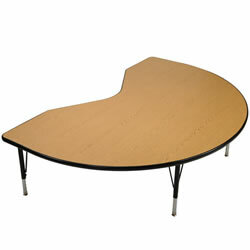 Broad worksurface is idea for art, writing, reading or play activities.Table measures 24" in diameter and 20 1/2" high. 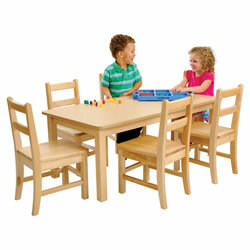 Includes four 12" high stackable stools which store easily underneath the table when not in use. Stool weight limit is up to 100 lbs. Simple assembly required. Quality materials and durable construction is the basis for this table with 1 1/2" thick high-pressure laminate tabletop surfaces and rounded bumper edges for safety. Chrome-finished legs adjust in 1" increments and have cushioned glides for easy movement. (21" to 30" high). Can seat up to 6 students. 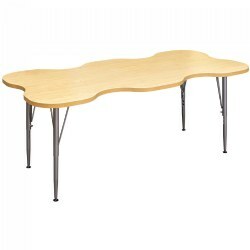 Quality materials and durable construction is the basis for this table with 1 1/2" thick high-pressure laminate tabletop surfaces and rounded bumper edges for safety. Black trim and black legs. Legs adjust in 1" increments and have cushioned glides for easy movement. Specify height. Our Carolina birch wooden tables are durable and well crafted. The solid birch side apron and 1 3/4" square legs keep it sturdy. Easy to clean laminated top. Furniture glides prevent scratching floors. Matches our entire birch collection of furnishings. Minor assembly required. Chairs not included. Choose leg height.